Yeah!!! We finally got my sunflower up! My dining room/kitchen/playroom/schoolroom area is all open and with seven children it often echoes quite a bit in there. 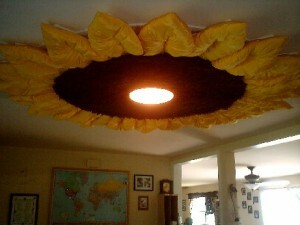 So we schemed and designed and came up with a “rug” to put on the ceiling to help with the noise level. The center is latch hook and was actually the longest part of the project. 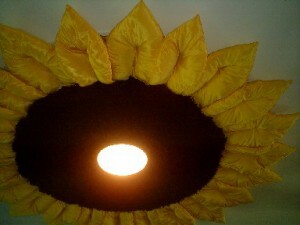 And the petals are made from some material that Dan rescued from a job and stuffed just like a pillow. Then my Dad stapled it all together on plywood and luan and we screwed it to the ceiling. Thanks Judy and Mom and Dad for your help! And everyone else who pitched in to help with the latch hook, the scheming, and design. Well, I got my help. Once again the Lord is insisting on doing it His way. I can work with this, though. At this point I am just extremely grateful for the assistance. Amazing, though, how quickly I start to doubt my decision. I no sooner get a breather, an easy day, a day without total chaos, and I start to think that I’m just making excuses for why I can’t handle this on my own. If I have the time and energy to do a few big projects every so often (like clean the garage) then surely I can keep after somehow. I just need to get organized, . . . . right? It is a fantastic relief to be freed from the responsibilities of cleaning and some of the cooking, though. I feel like I now have tons of time and energy and that makes me a lot more willing to spend some time playing with the kids (an output of energy I often avoid so I can make it through the day). And I also feel like there is more time and energy available for the training they all so desperately need. That is good. Now I just need to figure out how to rearrange my mindset and remember that I have delegated some of my chores to someone else for the advantage of my children. Thank you all for your prayers in this endeavor! The Lord has again provided just what I needed, just when I needed it most, and I know you all had a part in that. Thank you for your continued support!!! Picture your biggest problem (or even a little one). It’s something you worry about, something you don’t know how to fix. Maybe it’s even something that you know you can’t fix. There is nothing you can do to make the problem get better or even go away. Now picture taking that problem to someone who can take care of it. Example: I NEED a hole dug for a tree. If I don’t get the tree planted it will die. I have a shovel and seven children to watch. #1. I don’t have the time to dig a large hole. #2. Everything around here is rock, so even if I had the time a shovel wouldn’t get me very far. #3. I don’t have the dirt to help the tree to grow. Sounds like something of an insurmountable problem, huh. Now I take that problem to someone I know can take care of it. Somewhere I have a friend who owns a farm. On that farm he has a big tractor that can dig me a hole, he has a free Saturday coming up, and he’s got lots of manure that he’s more than willing to get rid of . Let me remind you that this is an example!! Imagine the relief that comes from knowing that my problem has a solution and it will be taken care of for me. That is where I am tonight. I’ve been aware of a problem. I am one person, trying to care for the needs of seven people. (Even teachers use a 5 to 1 ratio in the classroom and they get to send them all home! The difficulties at least double when those seven people can’t even take care of themselves.) After the loss of my nanny last year we settled into something of a routine and I thought we were doing o.k. Sure, some things were slipping, but I figured I just needed some more time to get into the groove. If God gave me seven children then surely He expects me to be able to care for them, right? Then we had a volunteer help for a month and I realized just how much was slipping. My kids notice it too. Chores aren’t getting done, follow through isn’t happening, attitudes are getting lazy, training is minimal, . . . etc. Tonight my Dad suggested to me that we need to go back to having a helper in the house. We don’t really know how we can do it, but the need is there. We discussed a couple of workable options and while we don’t have a solution just yet, I can feel the pressure releasing. God will make a way. I think I’ll be able to sleep tonight. Our speaker yesterday during church made the comment about how God takes our heart of stone and turns it into a heart of flesh, a living breathing organism. That’s not a new thought to me, but I was struck by another thought (POW!) =). God wants us to be vulnerable! I look around me and see the American mindset, “I can do it myself. I don’t need anyone.” We revere impenetrable figures like Superman and the Hulk. We are fascinated by movies portraying invincible vampires and superhuman strength. We don’t like pain, it hurts us. And so we avoid it at all costs. But that’s not what God wants. He wants us to be sensitive to those around us. He wants us to be tender to the touch of the Holy Spirit. He wants to use the pain in our lives to draw us closer to Him. You can bet that if you aren’t in a position to feel pain then you aren’t where the Lord wants you to be. Sounds a little sadistic, doesn’t it. And I remind myself that that is the world’s mentality. I don’t want to be one of those weak wimpy Christians that caves at the suggestion of torture. I don’t want to be an ineffectual soldier that can’t take a blow from the flat of a sword. I want to be a Stephen who accepts the blows of the rocks being thrown at him and looks toward heaven crying for the forgiveness of his persecutors. That sounds like it could hurt . . .